A Usable Demo is Coming Soon! After about one week’s hard work, without saying anything, we make a big progress on ForeUI, now the framework is about to finish, we are working on all kinds of components. Here is a screen shot of ForeUI, for us it is usable now but we still want to make it better before packing it. We hope to provide a demo (may be via webstart) next time. Finally we decide to use zip format, the zip file will pack the xml and images data inside. XML is a good format to represent such a plot, but it use more disk space and lack the ability to store the binary files (like icon images etc.) So a zip package that pack all these together will be good. Actually we planed to support JRE6+ only, but so far Mac OS X has JRE5 only (it is said to have JRE6 soon, but who knows) , so we changed the plan. I just check the source code, fortunately most code are compatible with JRE5, but the performance goes down a lot, I heared that JRE6 provides a lot of optimize in runtime, and now I believe it is true. Anyway, we will optimize the code to improve the performance, we hope ForeUI could work well in both JRE5 and JRE6. ForeUI will have a special feature: allow changing the theme of the UI prototype, the default theme will be “Wireframe Theme”, which represent the components with wireframe. 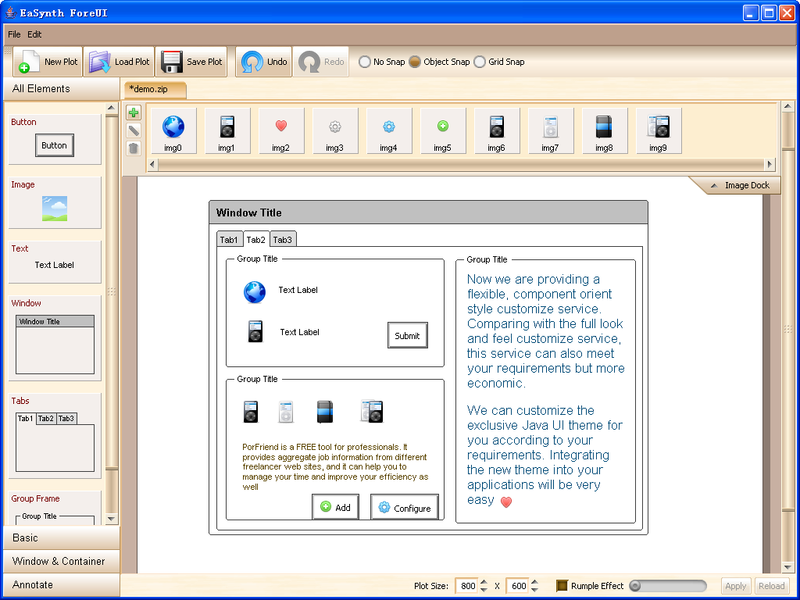 We will implement at least 3 more themes: Windows Theme, Mac OS X Theme and Java Theme, these themes will simulate the real UI effect, for preview purpose. For example: the user draw the screen once, then he/she can render it in different themes, to see what will it look like in Mac, in Windows or in Java. Again we have to work on EaSynth L&F designer first, ForeUI has no highest priority at this time. Anyway, the OX Editon is out and I think it is really good. We will continue working on ForeUI development from tomorrow on.